Following months of speculation, Beto O’Rourke, the former Democratic congressman from Texas who emerged as something of a national phenomenon in his losing bid against Sen. Ted Cruz, R-Texas, during the 2018 midterm election cycle, announced he is running for president in 2020. With his national profile, broad name recognition and a history of smashing fundraising records, O’Rourke jumps into the race immediately as a top-tier candidate. Although O’Rourke fell just 200,000 votes short in his bid to unseat Cruz in 2018, he has drawn comparisons to former President Barack Obama for his speaking style and bipartisan message of hope and unity. The former Texas congressman raised a staggering $80 million in his closer-than-expected performance to Cruz in November. His post-election missives have fueled interest from Democratic donors and the highest levels of the Democratic Party — including from Obama himself — that the right candidate could turn the reddest states blue in the next election cycle. “This is going to be a positive campaign that seeks to bring out the very best from every single one of us – that seeks to unite a very divided country,” O’Rourke said in a video shared Thursday to social media. Seated next to his wife, Amy, in his hometown of El Paso, Texas, O’Rourke said he would “travel this country” on a listening tour before returning to the border city for a campaign kick-off event on March 30. O’Rourke will follow his announcement with trip to Iowa this weekend — his first visit to the first-in-the-nation caucus state as a presidential candidate. During his three-day tour of the Hawkeye State, the Texas Democrat will hold both private and public events. He will also participate in a get-out-the-vote event to rally support for Eric Giddens, a Democratic state Senate candidate running in a special election in Iowa on March 19. Other presidential hopefuls, including Sens. Amy Klobuchar of Minnesota and Cory Booker of New Jersey, are also slated to knock on doors for Giddens this weekend. In February, O’Rourke gained widespread attention after headlining a massive rally in his hometown, El Paso, where he provide a counter argument to President Donald Trump’s call for a wall along the U.S.-Mexico border. The dueling rallies in the Texas city that shares a border with Mexico provided a significant preview of a possible 2020 presidential contest between Trump and O’Rourke, who outlined his vision for immigration reform, which includes a pathway to citizenship for so-called Dreamers and other undocumented immigrants, while the commander-in-chief took the stage a half-mile away at a “Make America Great Again” event to make another public demand for funding for a wall at the southern border and painted a dark narrative about the dangers of undocumented immigrants. The Texas Democrat’s “March for Truth” event in El Paso marked O’Rourke’s first foray onto the national stage since his Senate loss. While O’Rourke did not become a household name prior to his bid last year to unseat Cruz, the 46-year-old has generated excitement among high-profile Democrats who view him as the party’s best shot against Trump. O’Rourke said during his Senate campaign that he did not have Oval Office aspirations, but he admitted at a town hall late last year that his position had changed from what he said on the campaign trail and that he and his wife had “made a decision not to rule anything out.” By signaling that he was even open to throwing his hat in the ring for 2020, however, O’Rourke continued to generate buzz and speculation in the sprawling field of prospective Democratic candidates for 2020. O’Rourke has kept a low public profile following his Senate loss — before embarking on a solo road trip last month through parts of the Midwest and challenging Trump’s hardline stance on immigration — even as other high-profile Democrats announced their candidacies and began to lay groundwork in the early nominating states. The Texas Democrat and his wife previously expressed concern about the toll a presidential campaign could take on their three young children, especially after his long-shot, two-year campaign against Cruz. O’Rourke’s near-silence, in turn, had swirled speculation that his interest in a possible presidential bid might have dimmed. Indeed, in recent weeks, enthusiasm for O’Rourke appears to have slipped in public opinion polls. 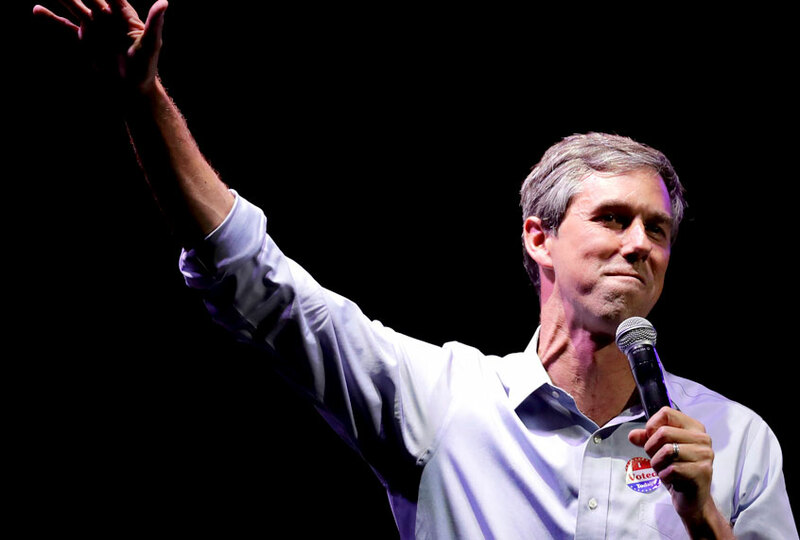 By jumping into the 2020 race, O’Rourke would likely face competition for the Democratic nomination from what is expected to be a very crowded Democratic field that already includes Sens. Kamala Harris of California, Cory Booker of New Jersey, Elizabeth Warren of Massachusetts, Bernie Sanders of Vermont, Kirsten Gillibrand of New York, Amy Klobuchar of Minnesota; Rep. Tulsi Gabbard of Hawaii, former secretary of Housing and Urban Development Julián Castro and South Bend Mayor Pete Buttigieg — and these names are far from the complete list of likely candidates. Despite O’Rourke’s late entrants to the presidential primary, the former congressman is likely to leapfrog most of his fellow contenders, largely because of his established name and his extensive fundraising network. To assist O’Rourke, a group of Democratic political operatives launched “Draft Beto,” an ambitious grassroots movement that has been raising money, attracting staffers and organizing volunteers in the four early nominating states of Iowa, New Hampshire, South Carolina and Nevada. The group said they would transfer their email lists and money to O’Rourke’s presidential campaign.